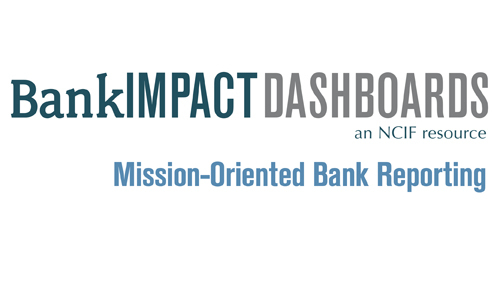 NCIF annually collects information from our partner banks on a wide range of datapoints that communicate the impact of mission-oriented banks in their communities. Bank-reported data is used to make individual Dashboards as well as an aggregate document describing the impact of the combined industry. NCIF assigns each of the self-reported datapoints a Unique ID to facilitate the reporting process. Where possible, we provide the alignment with the GIIN's IRIS initiative of standardized ​impact metrics. IRIS is the catalog of generally-accepted performance metrics that leading impact investors use to measure social, environmental, and financial success, evaluate deals, and grow the credibility of the impact investing industry. Using these shared metrics helps to reduce reporting burden and streamline data year to year, improving the data collection and analysis process for all parties. NCIF is proud to be recognized by IRIS, the Partner Metrics for Community Development Banking. Reporting is also aligned with CDFI Fund application and reporting datapoints allowing for reporting banks to use data collected for NCIF to complete applications and reporting, and vice versa. Questions have been aligned for the Bank Enterprise Award (BEA), Financial Assistance (FA), and certification applications as well as CIIS reporting. These additions streamline the reporting process for banks and allows for greater accuracy in the data points provided. See below for more information. Info1 1 OD5828 Organization name Name of the organization. Info2 2 Individual name Name of person completing survey. Info3 3 Individual title Title of person completing survey. Info4 4 Email address Email address of person completing survey. Info5 5 Phone number Phone number of person completing survey. Info6 61 Hours Number of hours it took to complete survey. Total assets The sum of all assets owned by the bank including cash, loans, securities, bank premises, and other assets at reporting period end. FP7 FP1129 FA application Total loans The total of loans and lease financing receivables, net of unearned income at reporting period end. FP9 FP9083 FA application Total deposits The sum of all deposits including demand deposits, money market deposits, other savings deposits, time deposits, and deposits in foreign offices at reporting period end. FP10 FP1301 FA application Net income A bank’s total earnings, calculated as net interest income plus total noninterest income plus realized gains (or losses) on securities and extraordinary items, less total noninterest expense, loan loss provisions, and income taxes at reporting period end. FP11 Risk based capital ratio Total capital (including both Tier 1 core capital and Tier 2 supplemental capital) as a percentage of risk-weighted assets, as defined by the appropriate federal regulator at reporting period end. FP12 Tier 1 risk-based ratio Tier 1 (core) capital as a percent of risk-weighted assets, as defined by the appropriate federal regulator at reporting period end. FP13 Tier 1 common risk-based ratio Tier 1 common capital as a percent of risk-weighted assets. CIIS reporting Non-performing loans ratio Nonperforming loans/total loans at reporting period end. The sum of loans and leases 90 days or more past due, and loans and leases in nonaccrual status, as a percentage of gross loans and leases. This ratio shows the portion of a bank’s loans that may have to be written off in the future. Net charge off ratio Net charge offs/average loans at reporting period end. The sum of loans and leases charged off (removed from balance sheet because of uncollectibility), less recoveries, as a percentage of average total loans. Loan loss reserves Loan loss reserves/gross loans at reporting period end. The amount of money reserved for uncollectible loans as a percentage of total loans and lease financing receivables, excluding unearned income. FP27 FP4326 Return on assets Return on assets at reporting period end. Calculated as net income after taxes and extraordinary items as a percentage of average total assets. FP28 FP2651 Return on equity Return on equity at reporting period end. Net income as a percentage of average equity on a consolidated basis. FP29 Net interest income/average assets Net interest income/average assets at reporting period end. Total interest income less total interest expense, as a percentage of average earning assets. Efficiency ratio Measures the proportion of net operating revenues that are absorbed by overhead expenses, so that a lower value indicates greater efficiency. Calculated as noninterest expense of intangible assets, as a percent of net interest income plus noninterest income. Loans/deposits ratio Loans/deposits at reporting period end. Calculated as loans and lease financing receivables, net of unearned income, allowances, and reserves, as a percentage of total deposits. FP32 Net non-core funding dependence Net non-core funding dependence at reporting period end. Non-core liabilities less short-term investments divided by long-term assets. OD1 9 OD2735 CDFI Certification Mission statement The mission statement of the organization. OD4 6 OD7111 CIIS reporting Fiscal year end Date of institution's fiscal year end. IRIS ID refers to end of reporting period, which should be the fiscal year end for NCIF reporting. OD5 7 OD9109 CDFI status Community Development Financial Institution (CDFI) certification status of the institution. The certification is issued by the CDFI Fund. OD6 8 MDI status Minority Depository Institution (MDI) status of the institution. Status comes from the FDIC. OD7 55 OD2319 FA application Partnership narrative Description of existing partnerships the institution has with the surrounding community? Examples may include partnerships with other banks, loan funds, universities, business development centers, non-profit organizations, foundations, and various civic organizations. Please note if the bank is engaged in engaged in public policy or advocacy projects or is the institution involved in regional and national trade groups. Market need narrative Description of the market in which the bank operates, Include areas served, an overview of economic conditions compared to the surrounding area and other information that may distinguish your bank’s service area from that of others. Include descriptions of particular underserved or specific clients served. OD12 Service area The size of the service area of the institution. Options include National, Multi-state, State, Multi-county, County, and City or Town. OI1 10 OI3160 Full-time employees: total Number of paid full-time employees at the organization as of the end of the reporting period. Full-time employees work at least 35 hours per week. OI2 10 OI6213 Full-time employees: female Number of paid full-time female employees at the organization as of the end of the reporting period. Full-time employees work at least 35 hours per week. OI3 10 OI8147 Full-time employees: minority Number of paid full-time employees at the organization who belong to minority or previously excluded groups as of the end of the reporting period. Per the CDFI Fund TLR reporting guidelines, “minority” is defined as persons who are not racially White. OI4 10 OI1075 Board of directors: total Number of members of the organization's board of directors or other governing body, as of the end of the reporting period. OI5 10 OI8118 Board of directors: female Number of female members of the organization's board of directors or other governing body, as of the end of the reporting period. OI6 10 OI6696 Board of directors: minority Number of board of directors or other governing body members who belong to minority or previously excluded groups, as of the end of the reporting period. Per the CDFI Fund TLR reporting guidelines, “minority” is defined as persons who are not racially White. OI14 42 Green/ environmentally friendly policies Indicate if the institution has any other written policies or procedures in place to promote green or environmentally responsible practices. Green or environmentally responsibly practices include procurement policies, operational activities, lending or other practices which reduce greenhouse gases, volatile organic compounds, or other harmful chemicals and waste and/or practices which support conservation of energy and other resources. OI15 43 Green/ environmentally friendly procurement policies Indicate if the institution has procurement policies which promote green or environmentally responsible purchases. Examples may include green office supplies, green cleaning products, purchases of office equipment. Greenhouse gas and energy use tracking Indicate if the institution tracks energy use or greenhouse gases. This may include greenhouse gases (GHG) emitted through the organization's operations during the reporting period. This should include GHG emissions from direct and indirect sources. OI17 45b Tracking method Description of the tracking methods for greenhouse gas emissions or energy use. OI18 46 OI6765 Green building practices Indicate whether the organization employs green building practices. Include certifications such as LEED or other third party building certifications. OI19 46b Buildings with certification Indicate the percentage of buildings which have green building practices or are certified through LEED or similar programs. Include both headquarters and branch locations. OI20 48 Green/ environmentally friendly lending priorities Description of the institution’s green or environmentally responsible lending priorities. Indicate if the bank has interests in particular lending products or preferences for projects with green or environmentally responsible elements. Green or environmentally responsible lending includes a) loans to entities whose primary function relates to environmentally sustainable ends and/or b) loans that have a primary intended use of funds to promote environmental sustainability. Examples include financing alternative energy generation; construction or renovations that include green features; an environmentally sustainable small business; organizations whose primary focus is conservation, sustainability, or environmental education. OI22 Green/ environmentally friendly lending tracking Description of how the institution tracks the impacts of green or environmentally responsible loans. Green or environmentally responsible lending includes a) loans to entities whose primary function relates to environmentally sustainable ends and/or b) loans that have a primary intended use of funds to promote environmental sustainability. Green or environmentally responsible loans may result in positive impacts in their communities. For example, a loan to an alternative energy production plant may result in a reduction of emission rates of greenhouse gases associated with coal or gas power plants. Please provide a description of impacts tracked or indicate if the impacts are not currently tracked. Institutions should refer to internal understandings of green or environmentally responsible. OI23 47 PD7932 Green/ environmentally friendly policies Indicate if the institution has any other written policies or procedures in place to promote green or environmentally responsible practices. Green or environmentally responsibly practices include procurement policies, operational activities, lending or other practices which reduce greenhouse gases, volatile organic compounds, or other harmful chemicals and waste and/or practices which support conservation of energy and other resources. OI24 44 Local sourcing Indicate if the institution has a procurement policy which supports the local sourcing of products. PD1 11 OD1777 Service area states List of the US states in which the institution operates. Include all states in which the institution provides products or services or has branch locations. PD2 13 Mission-oriented loans Indicate if the institution provide mission-oriented loans. These loans support a type of lending or type of client that is identified in the organization’s mission or supports goals as defined by the organization. PD3 56 PD9681 FA application Non-financial services narrative Description of any non-financial services offered by the institution. For example, does the institution offer financial training and literacy to individuals, community groups and businesses? Does it offer other services such as discounted tax preparation advice, workshops and counseling? PD4 22 PD5098 Other financial services offered: prepaid cards Indicate if the institution offers prepaid cards. Prepaid cards are issued by a financial institution that is preloaded with funds and is used like a normal credit card. PD5 23 PD5098 Other financial services offered: mobile banking Indicate if the institution offers mobile banking. Mobile banking is conducted with the use of wireless handheld devices such as cellular phones and to conduct banking transactions. PD6 25 PD5098 Other financial services offered: check cashing Indicate if the institution offers check cashing as an alternative to check cashing agencies. PD7 26 PD5098 Other financial services offered: deposit secured loans Indicate if the institution offers deposit secured loans. Deposit secured loans use the individuals funds, often in a savings or checking account, as collateral for the loan. PD8 14 PD5098 Other financial services offered: small dollar loans Indicate if the institution offers small dollar loans. Per the CDFI Fund, Small Dollar Consumer Loans are affordable loans that serve as available alternatives to the marketplace for individuals who are Eligible Residents with a total principal value between $500 and $5,000 and have a term of ninety (90) days or more. PD9 30 PD5098 Other financial services offered: other List any additional products or services targeted to low- and moderate-income clients that are not otherwise listed. PD10 53 FA application Credit products and services narrative Description of the credit products and services offered by the institution and how do they accommodate the needs of low-and moderate-income customers. Examples include: does the institution offer credit builder products or mortgage products tailored to the needs of its customer segments, is the institution a SBA Preferred Lender, or does it use Alternative Credit Scores to evaluate credit worthiness, etc. PD11 54 Non-credit products and services narrative Description of the retail deposit, savings and checking products offered, and how do they cater to the low and moderate income communities. For example, how does the institution utilize credit cards, debit cards, stored value cards, Individual Development Accounts (IDAs) and other innovative financial services to serve underbanked consumers? PD13 16 NMTC transactions: number The number of New Market Tax Credit transactions that the bank participated in during the reporting period. This includes loan participations, equity investments, receiving an allocation etc. PD14 16 NMTC transactions: dollar amount The dollar amount of New Market Tax Credit transactions that the bank participated in during the reporting period. PD15 34 Credit score The average credit score for borrowers. Provide the average credit score for all clients who recieved a loan during the reporting period. PD18 24 PD5098 Other financial services offered: online banking Indicate if the institution offers online banking. Online banking includes online functions to transfer funds to and from accounts, pay bills, and view your account balances, transactions, statements, paid checks, and deposit slips etc. PD19 27 PD5098 Other financial services offered: secured credit cards Indicate if the institution offers secure credit cards. Secured credit cards are backed by a savings account used as collateral on the credit available with the card. Money is deposited and held in the account backing the card. PD20 29 PD5098 CIIS reporting Other financial services offered: IDA accounts Indicate if the institution offers Individual Development Accounts (IDA). A savings account often designed for lower-income individuals, an IDA is used for a specific purpose such as education, purchasing a first home, or starting a business. PD21 19 PD5098 Volunteer Income Tax Assistance offered Indicate if the institution offers Volunteer Income Tax Assistance (VITA). Sites which offer VITA offer free tax help to people making below an income threshold. IRS-certified volunteers provide free basic income tax return preparation with electronic filing to qualified individuals. Indicate if the institution provides green and\or environmentally friendly loans. Green or environmentally responsible lending includes a) loans to entities whose primary function relates to environmentally sustainable ends and/or b) loans to a projects that promote environmentally sustainability. PD23 13 CIIS reporting Lending to women-owned businesses Indicate if the institution provides loans to women-owned businesses. Per the CDFI Fund, a women-owned or controlled business is a business that is more than 50 percent owned or controlled by one or more women. If the business is a for- profit concern, 50 percent or more of its owners must be women; if the business is a nonprofit concern, 50 percent or more of its board of directors must be women (or, its Chief Executive Officer or Executive Director, General Partner, or Managing Member must be a woman). PD24 13 CIIS reporting Lending to minority-owned businesses Indicate if the institution provides loans to minority-owned businesses. Per the CDFI Fund, a minority-owned or controlled business is a business that is more than 50 percent owned or controlled by one or more minorities. If the business is a for- profit concern, more than 50 percent of its owners must be minorities; if the business is a nonprofit concern, more than 50 percent of its board of directors must be minorities (or, its Chief Executive Officer, Executive Director, General Partner, or Managing Member must be minority). Lending to low-income borrowers Indicate if the institution provides loans to low-income borrowers. Per the CDFI Fund, an individual is low-income if they have an annual income, adjusted for family size, of not more than: for metropolitan areas, 80 percent of the area median family income; and for non-metropolitan areas, the greater of: (i) 80 percent of the area median family income; or (ii) 80 percent of the statewide non-metropolitan area median family income. PD26 13 PI4237 FA application Lending to minority borrowers Indicate if the institution provides loans in minorities. Per the CDFI Fund, an individual is a minority if they are not racially white. PD27 13 PD7993 Lending to nonprofit organizations Indicate if the institution provides loans to nonprofit organizations. PD28 13 Lending to faith-based organizations Indicate if the institution provides loans to faith-based organizations. PD30 13 PD2541 Lending to low- and moderate-income areas Indicate if the institution provides loans in low- to moderate-income areas. Indicate if the institution provides loans to projects which benefit low- to moderate-income individuals. PD32 13 CIIS reporting Lending to other targeted populations (OTP) Indicate if the institution provides loans to other targeted populations. Per the CDFI Fund, other targeted populations are a CDFI Program Target Market that is an identifiable group of individuals in the organization's service area for which there exists a strong basis in evidence that the group lacks access to loans, equity investments, and/or financial services. PD33 PD5098 Other financial services offered: unsecured credit cards Indicate if the institution offers unsecured credit cards. Unsecured credit cards are not backed by any depository account that can be used as collateral on the credit available with the card. PD34 PD5098 Other financial services offered: trust, insurance, and/or asset management services Indicate if the institution offers trust, insurance, and/or asset management services. Individuals receiving training: technical assistance Number of individuals who received one-on-one technical assistance from the organization during the reporting period. Count all individuals that attended formal workshops and seminars as well as those individuals that received assistance from bank staff to qualify for a loan, access a financial product, etc. Training of an institution's own employees is not included in this metric. PI2 18 PI6065 CDFI Certification Organizations receiving training Number of organizations that received training from the reporting organization during the reporting period. Count all organizations that attended formal workshops and seminars or that received assistance from bank staff to qualify for a loan, access a financial product, etc. Training of an institution's own employees is not included in this metric. PI3 12 PI1190 Client individuals: rural Number of unique individuals in rural areas who were clients of the organization during the reporting period. Rural areas are those not characterized as peri-urban (suburban) or urban. The principal difference between urban and rural areas tends to be a matter of the degree of concentration of population. PI4 12 PI6751 Client individuals: urban Number of unique individuals in urban areas who were clients of the organization during the reporting period. Urban areas are characterized by higher population density and vast human features in comparison to areas surrounding it. Include both central city and surrounding suburbs. PI5 32 PI4237 Client individuals: minority Number of unique individuals who belong to minority or previously excluded groups and were clients of the organization during the reporting period. Per the CDFI Fund TLR reporting guidelines, “minority” is defined as persons who are not racially White. PI6 32 PI8330 Client individuals: female Number of unique women who were clients of the organization during the reporting period. PI7 33 PI4060 Total lending clients Number of the total lending clients the institution had in at the end of the reporting period. PI8 33 PI4060 Total deposit clients Number of the total deposit clients the institution had at the end of the reporting period. Includes checking, savings and time deposits. Each customer should be counted once, regardless of how many accounts they hold. PI9 21 Total deposit accounts Number of deposit accounts held at reporting period end. Provide a count of the total number of deposit accounts the institution had during the reporting period. Count each account separately. PI12 21 Total small deposit accounts Number of deposit accounts with less $1,000 as of the end of the reporting period. PI13 33 PI4060 Total transaction clients Number of the total transaction clients the institution at the end of the reporting period. Transactions clients include those accessing non-credit and non-savings products and services such as check cashing, remittance and bill pay. Jobs created at directly supported/ financed enterprises: total Net number of new full-time equivalent employees working for enterprises financed or supported by the organization at the end of the reporting period, and since the beginning of support/investment by the organization. For example, what is the number of jobs created at a business that received a loan? PI15 38 Jobs created at directly supported/ financed enterprises: female Net number of new full-time equivalent employees who are female working for enterprises financed or supported by the organization at the end of the reporting period, and since the beginning of support/investment by the organization. PI16 40 Jobs created at directly supported/ financed enterprises: minority Net number of new full-time equivalent employees who are minorities working for enterprises financed or supported by the organization at the end of the reporting period, and since the beginning of support/investment by the organization. Per the CDFI Fund TLR reporting guidelines, “minority” is defined as persons who are not racially White. PI22 15 FA application Off balance sheet loans: number The number of off-balance sheet loans. These loans were originated and then sold to third parties such as Fannie Mae and Freddie Mac and are otherwise not reflected on the institution’s balance sheet. Include loans from the reporting period. PI23 15 FA application Off balance sheet loans: dollar amount The dollar value of off-balance sheet loans. These loans were originated and then sold to third parties such as Fannie Mae and Freddie Mac and are otherwise not reflected on the institution’s balance sheet. Include loans from the reporting period. PI24 49 Green/ environmentally friendly loans originated: number Number of green or environmentally responsible loans originated during the reporting period. Green or environmentally responsible lending includes a) loans to entities whose primary function relates to environmentally sustainable ends and/or b) loans that have a primary intended use of funds to promote environmental sustainability. Examples include financing alternative energy generation; construction or renovations that include green features; an environmentally sustainable small business; organizations whose primary focus is conservation, sustainability, or environmental education. PI25 50 Green/ environmentally friendly loans originated: dollar amount Dollar amount of green or environmentally responsible loans originated during the reporting period. Green or environmentally responsible lending includes a) loans to entities whose primary function relates to environmentally sustainable ends and/or b) loans that have a primary intended use of funds to promote environmental sustainability. Examples include financing alternative energy generation; construction or renovations that include green features; an environmentally sustainable small business; organizations whose primary focus is conservation, sustainability, or environmental education. PI26 33 PI4060 Client individuaks: total Number of unique individuals who were clients of the organization during the reporting period. This number should count clients from all products types as unique individuals. This will number will serve to illustrate the institution's total reach within its communities. Providing this number separately from the additional clients served questions that follow will prevent double counting. PI27 35 OI5479 New jobs at bank Number of new full time equivalent jobs created at the reporting institution during the reporting period. Employees with full time jobs work at least 35 hours per week. PI28 20 Dollar value of technical assistance Quantify the dollar value of all technical assistance provided by the bank based on staff time committed and other costs expended. Include value of formal workshops and seminars as well as those individuals that received assistance from bank staff to qualify for a loan, access a financial product, etc. Training of an institution's own employees is not included in this metric.